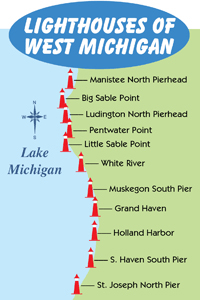 With four of the Great Lakes surrounding the state, it stands to reason that Michigan has more lighthouses than any other state...over 150. 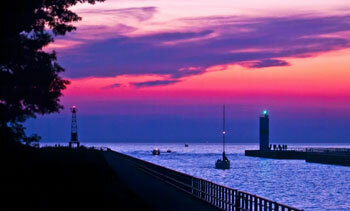 Lake Michigan itself has over 50 beautiful lights, with the majority in Michigan and Wisconsin. 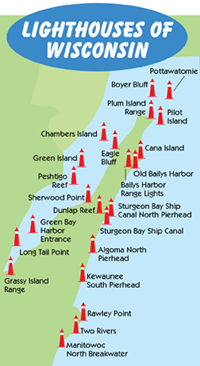 Many people enjoy taking the Lake Michigan Circle Tour, visiting as many of these lighthouses as possible. Their historical significance, as well as their various shapes and colors, make this a fascinating vacation. From St. Joseph's North Pier Light in southwestern Michigan all the way up to McGulpin Point Lighthouse at the Straits of Mackinac....the western coast of Michigan is home to about 35 lighthouses. The eastern coast of Lake Michigan in Wisconsin boasts about the same number, including a wonderful cluster in Door County. Most Lake Michigan lighthouses were built in the 1800s when ship traffic was at its heaviest...especially during the lumbering era. Long before marine radios, lighthouses were the only means to safely navigate the harbors, many of which were rocky. The comforting beams of light guided thousands of ships with their precious cargoes into port. Many lighthouse keepers inhabited these structures, or lived nearby and walked the dangerous catwalks out to the light. Today the lights are automated and guide fishing boats and other pleasure craft to safety. They also serve as tourist attractions. Many are open during the summer offering a climb to the top to enjoy the magnificent views of Lake Michigan. Why is there such a fascination with lighthouses? One reason may be their location...along beautiful shorelines. They are a photographer's dream, especially during one of Michigan's glorious sunrises or sunsets. Another reason is their unique architecture--no two lighthouses are alike, and they're built to withstand the toughest of weather conditions. The view from the top, along with the sparkling Fresnel lenses, are reason enough to climb the numerous steps up. 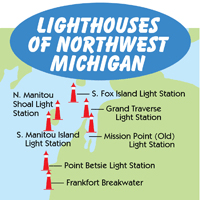 Thanks to groups like the Great Lakes Lighthouse Keepers Association and its smaller organizations, these lighthouses have been preserved and maintained so that future generations can enjoy and appreciate them. Hundreds of volunteers serve as hosts during the summer, sharing the rich maritime history with visitors as they tour the lighthouses. 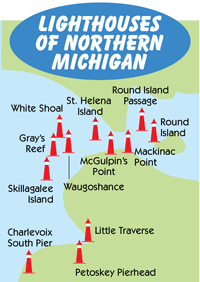 Plan your next vacation along Lake Michigan and visit some of the most beautiful lighthouses our country has to offer.